Bellaire United Methodist Church is hosting its annual Fall Fun Festival Saturday, Oct. 25, 8 a.m.-2 p.m. There will be a free children’s carnival with games, plus baked goods, international dishes, hot dogs and chips. Be sure to check out the 300-family garage sale to see what you can find, and bid on silent-auction baskets. All proceeds go back into the community through outreach programs for the homeless, underprivileged children, Alzheimer’s programs and cancer support. 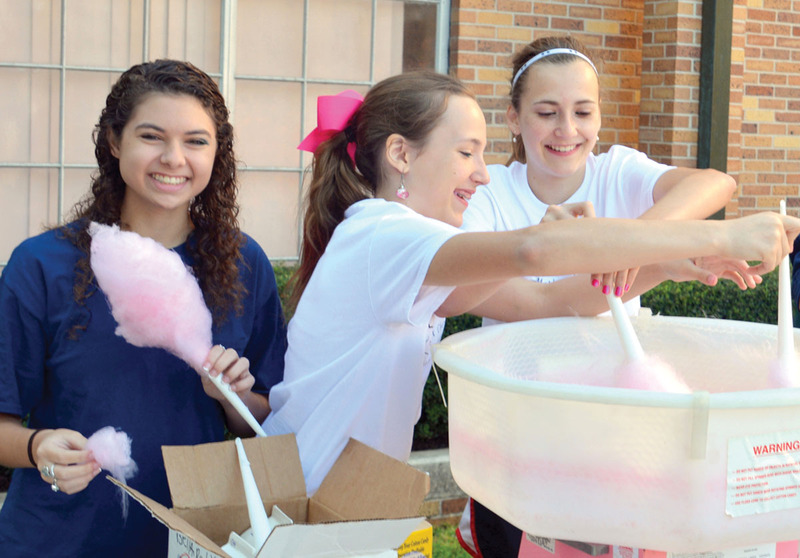 Pictured (from left) are Claire Ounanian, Amy Vaughan and Bethany Vaughan, who are part of the church youth group and volunteered to make cotton candy at a past carnival. Editor’s note: The Buzz is happy to report that Annie and Tyler McQueen’s twin babies are doing well. Annie Blaylock McQueen, associate editor and Buzz About Town columnist, is currently out on maternity leave, spending time with her babies, Cash and Lila. In the meantime, Jordan Magaziner is handling this section. As usual, please send your high-res photos and community news to The Buzz at info@thebuzzmagazines.com or 5001 Bissonnet, Suite 100, Bellaire, TX 77401. Items are published on a space-available basis.